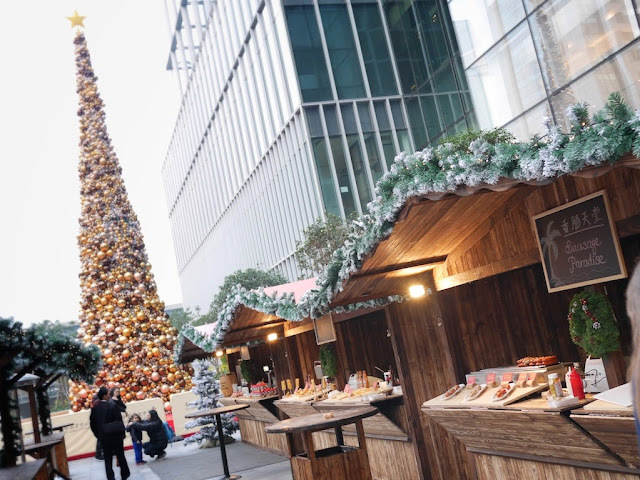 Posts from two years ago about Christmas in China's Fujian province include "The Christmas Holiday in Putian, China", "Students Selling Christmas Apples in Quanzhou, China", and "A Quanzhou Church and Police on Christmas Eve". 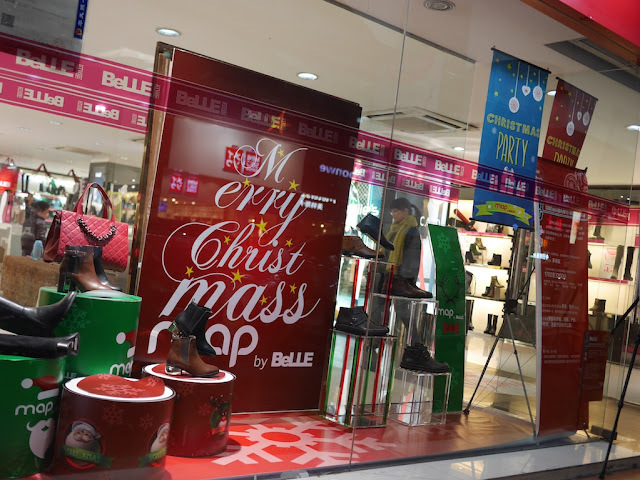 To follow up on the theme, here are two signs of the Christmas spirit I happened to see this year in Zhangzhou, Fujian. 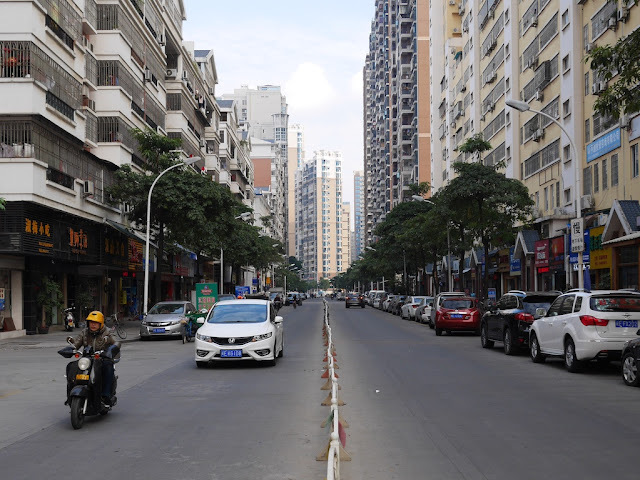 If you identified the location of the photos I shared last week as Zhangzhou (漳州), the southernmost prefecture-level city in Fujian province (map), treat yourself to a bowl of Zhangzhou-style duck noodle soup or whatever other Zhangzhou treat you desire. If you didn't, I still recommend trying the soup. 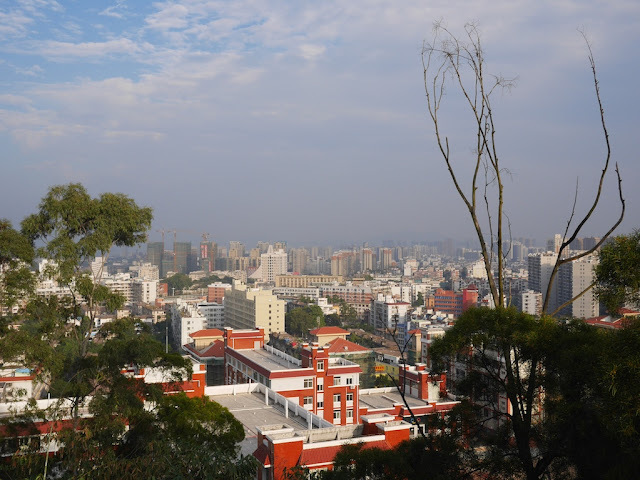 The coastal city borders the far better known (at least in China) city of Xiamen. 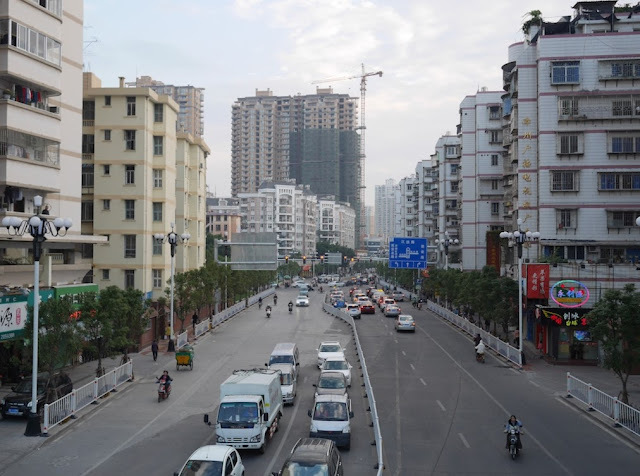 By high-speed rail it is about 8 hours south of Shanghai and 3.5 hours northeast of Shenzhen, which borders Hong Kong. When I passed through Zhangzhou over a year ago on a long-distance bus, this portion of the high-speed rail line was sadly not yet open. 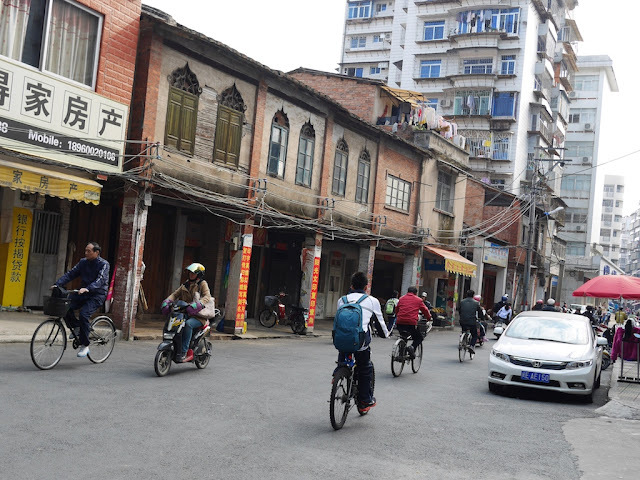 Similar to what I did earlier this year with Yangjiang's Jiangcheng District in Guangdong province, I will share a set of street scenes from a central urban area in Zhangzhou's Xiangcheng District (芗城区) north of the Jiulong River. 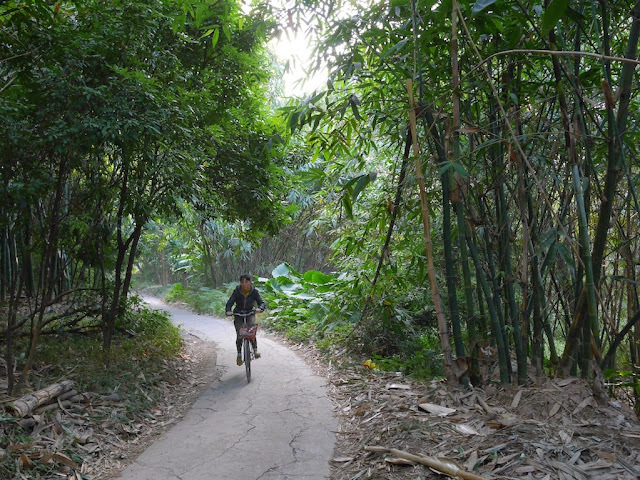 Like the Yangjiang post, the photos were all taken within an approximately 10 km2 (4 sq mi) area, and I walked to all of the locations. 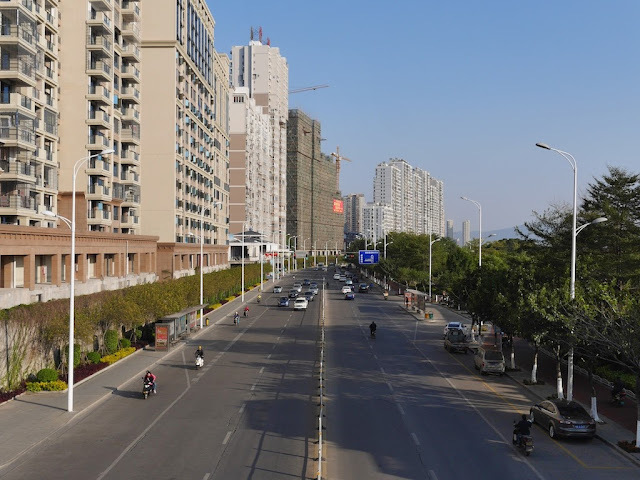 Although they certainly are not representative of Zhangzhou as a whole, which covers an area of 12,888 km2 (4,976 sq mi), they offer a brief "everyday" look at a central area in Zhangzhou and provide a bit of context for upcoming posts. And if they raise a few questions, all the better. 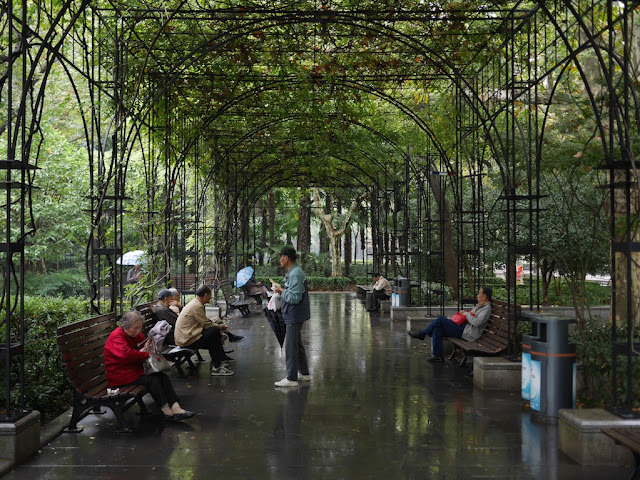 I don't expected it to help in guessing the city (answer coming soon), but here is another scene from a park I recently visited in China. 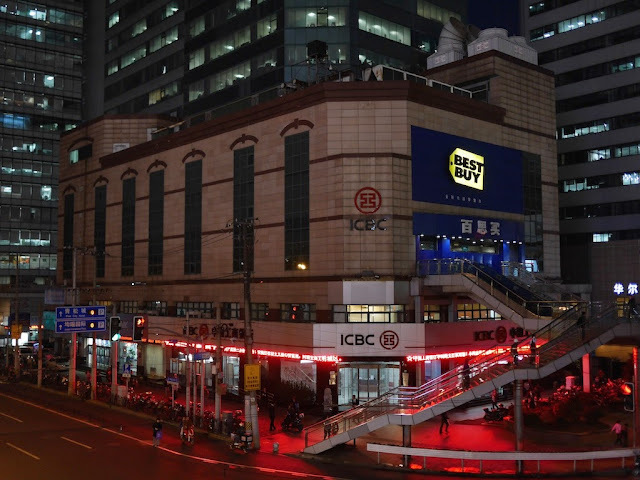 Best Buy opened its first store in China at the end of 2006 not long after it had acquired a majority interest in the Chinese electronics chain Jiangsu Five Star. 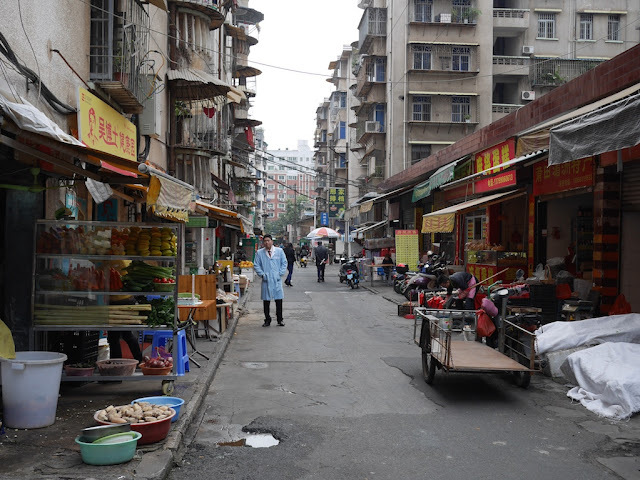 The store was hard for me to miss as I was living just a block or two (depends on how you count them) away in Shanghai's Xujiahui district. I visited the store during one of its earliest days and had the opportunity to speak to a manager who had come from the U.S. 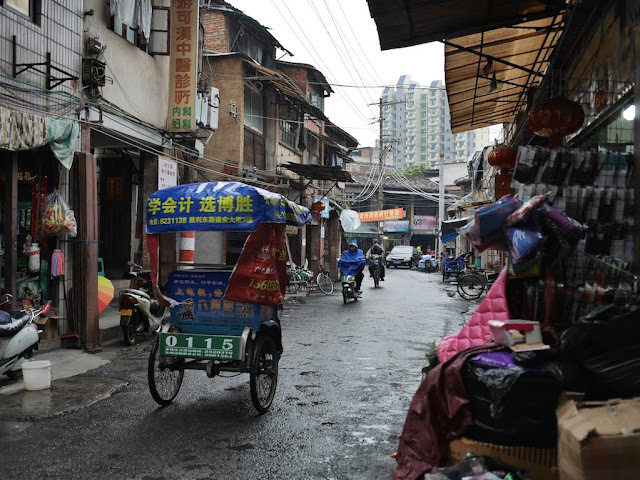 He said their plan was to use the Xujiahui store as a testing ground and not open others in China until they had it right — even if it meant waiting one to two years. He also explained that the absence of movies for sale, a noticeable difference from their U.S. stores, was due to difficulties in obtaining a license to properly sell DVDs. Given the many nearby small stores selling pirated DVDs without much problem, this seemed a bit ironic. The most striking part of the conversation to me, though, was when he expressed surprise over the numerous visitors that day and portrayed it as a sign of success. 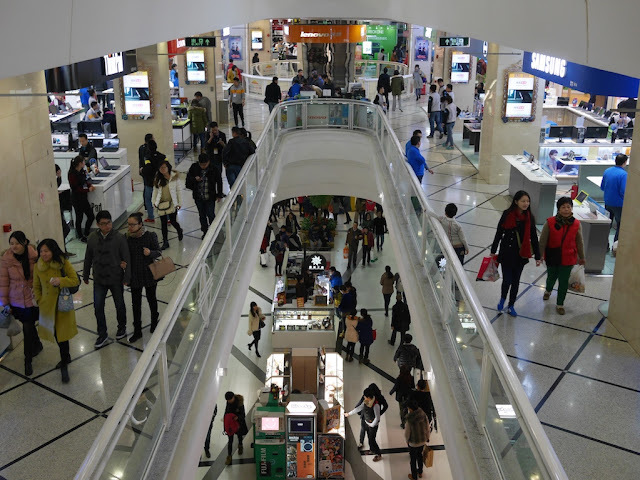 I knew, especially in China, crowds didn't necessarily lead to what really mattered for a retail business — sales. If the manager had pondered the area with many cash registers but few customers buying anything, he may have been less enthusiastic. Not long after my first visit, I decided to buy a mobile phone at the store. I personally found the shopping experience far more positive than what I had found elsewhere. At the time, it was the only store I had seen in Shanghai where I could easily try working models of a variety of phones. After making my decision, I was told they didn't have the color I desired in stock and weren't sure when they would. Sadly, I left the store to try to find the phone elsewhere. Happily, I quickly found it at a nearby store at a lower price. Best Buy’s management told me, over and over, that “our market studies show Chinese consumers like to try out products,” and that Best Buy’s interactive displays would take advantage of that predilection, put the company over the top in Shanghai. Lo and behold, it was kind of true: Shanghai’s shoppers would go to Best Buy to try out products – and then promptly march across the street to one of the other Chinese retailers and buy them for less [BG: basically, my experience minus the step of actually trying to buy the product at Best Buy] (in stores with much deeper production selection, no less). In this case, Best Buy listened to research about what customers in China wanted — good — but apparently didn't accurately evaluate the entire purchasing experience & environment — not good. I also wondered if there might be less transparent reasons for the closings. 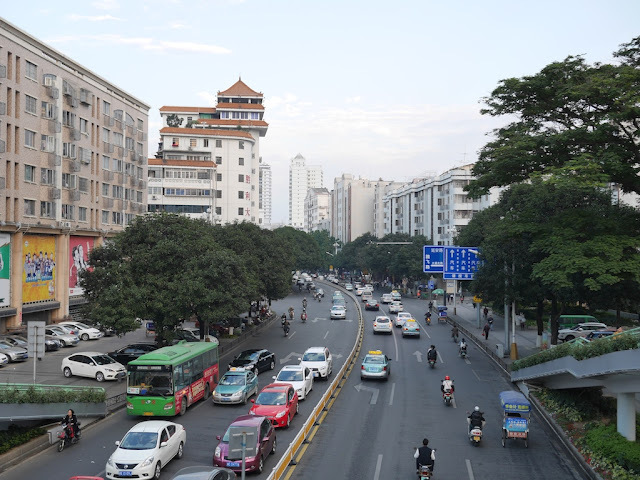 Sometimes due to not fully appreciating China's legal requirements and conditions, companies set up their business structures in a way that is not conducive to success nor easy to fix. The best, though painful, solution can be to start from scratch again. In this case, Best Buy may have been able to take advantage of its Five Star chain to do something similar. Whatever the cause, Best Buy's stores had met a fate in China that Europe's largest electronics chain, Media Markt, later met as well. 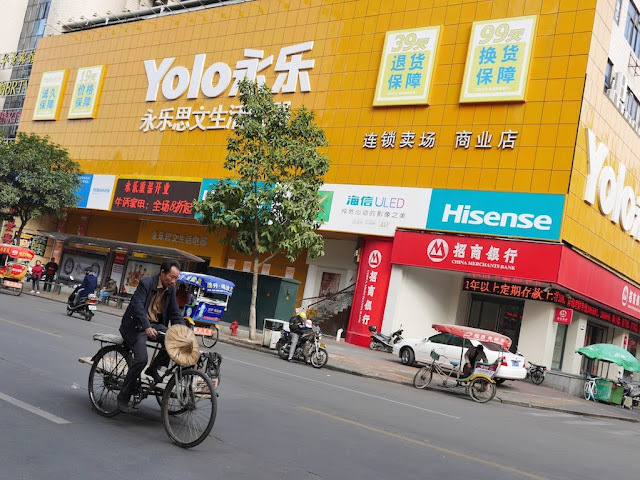 It wasn't the end of the story for Best Buy in China though. It still had Five Star. Best Buy is selling Jiangsu Five Star Appliance Co. to Chinese real estate company Zhejiang Jiayuan Real Estate Group Co. for an undisclosed amount, a spokeswoman for Best Buy said Thursday. She said that Best Buy is exiting the China market except for its sourcing operations, and that the sourcing of its private-label products—everything from tablets and cords to televisions—is projected to grow. Oh, all the memories . . . There is one thing that oddly enough isn't only a memory now. 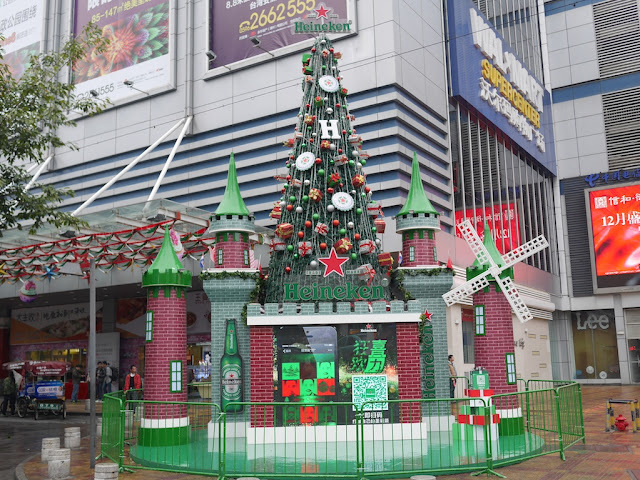 It has to do with Best Buy's Xujiahui store which appears in the photo at the top of this post. The photo wasn't taken when the store had its soft opening in 2006. It wasn't even taken before the store's closing in 2011. Instead, I took the photo less than one month ago — over 3 years after the store closed. Yes, not only is this large retail space in a prime shopping area still boarded up, it still has a large Best Buy sign. And any night I have passed by since the store's closing the sign has been lit up during "opening hours". Just to be clear, this is not normal behavior for a closed store in China. The answer . . . I only have guesses. For example, perhaps Best Buy could not get out of the lease for the space. Best Buy may have figured it might as well keep the sign going. Or maybe unseen sections of the store are being used as office space by Best Buy. If true, I would question whether they couldn't do something better with the front entrance (there was another entrance from a parking lot below) than surrounding it with a wall of blue boards. If you have an answer, I would love to hear it. There may be yet another interesting and valuable lesson to be gained from Best Buy's experience. At least for now, their light still shines in China. 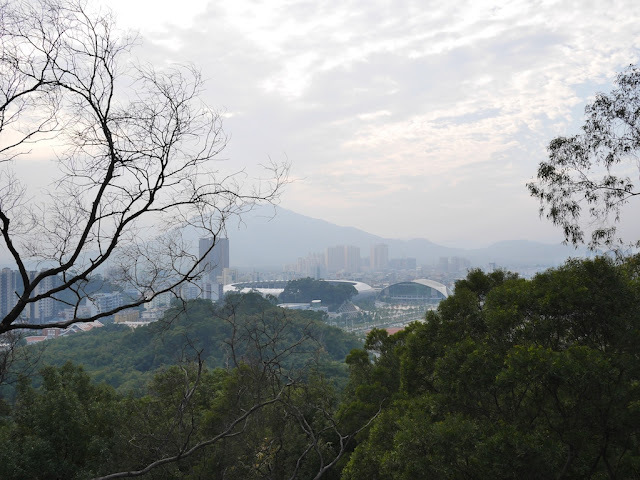 I walked up a mountain in a park . . .
took the stairs to the top of a small tower at its peak . . .
and looked at the surrounding urban areas. As the photos may have already suggested to some readers, I am not in Shanghai. Instead, I am in one of the many prefecture-level cities unheard of by most people outside China despite having a population in the millions. 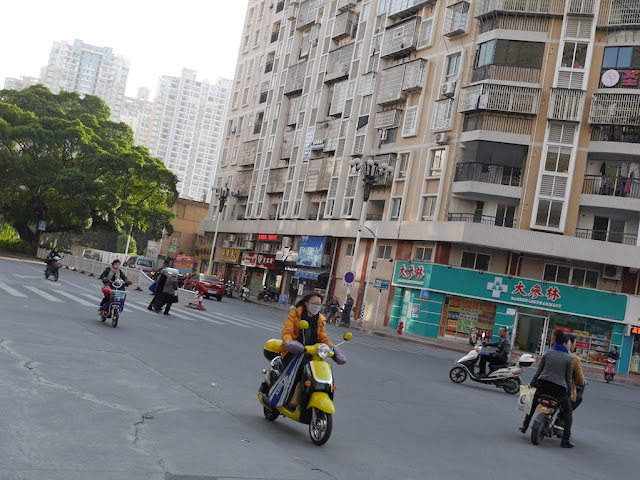 I have a little more about Shanghai I would like to share before bringing additional attention to my current location. So this is an opportunity to see if any readers can identify the city based on the above photos. In addition to the clues within them, I will provide two more: I came here by high-speed rail and enjoyed a savory local-style oyster omelet for lunch. If people were told there is a restaurant in Dallas named Mr. Panda and asked what type of food it served, how would they respond? I would guess many Americans would guess "Chinese food", and they'd be correct. If those same people were told there is a restaurant in Shanghai named Mr. Panda and asked what type of food it served, how would they respond? I am less sure of the response, but I would guess not many would say "pizza". However, "pizza" would indeed be a correct answer for Mr. Panda's seven locations in Shanghai. Mr. Panda's pizzas are large, 18 inches in diameter, and can be bought whole or by the slice. Like a number of other pizza restaurants in China, some of its pizzas include toppings tailored to local tastes. 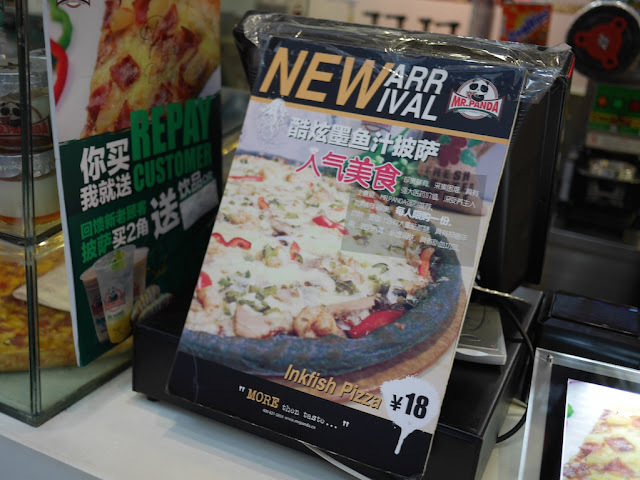 Unlike a number of other pizza restaurants in China, if offers the "Inkfish Pizza" (the more dramatic Chinese name: 酷炫墨鱼汁披萨). Yes, it has a black crust with yummy cephalopod ink. Unlike the squid ink breakfast hot dog I saw promoted at a Macanese restaurant in Hong Kong, I decided I had to give it a try. 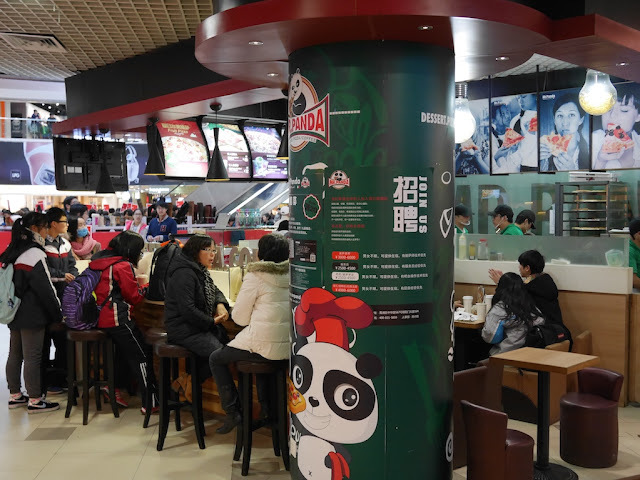 I bought a slice at 18 RMB (slightly less that U.S. $3) and found myself a place in the small seating area at Mr. Panda's location in the SML Center shopping mall. 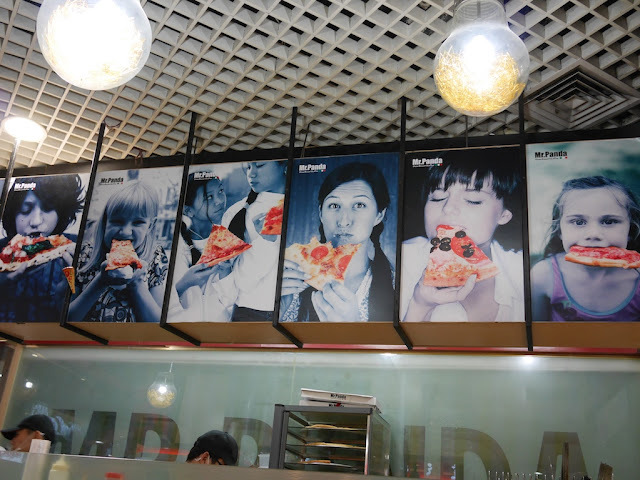 I looked up for motivation and noticed that none of the people portrayed above me were eating the inkfish pizza. And then I considered my slice of pizza. The visual was not exactly inspiring and expectations for the pizza's taste were sinking. Based on some reactions from passersby, I could tell I was not the only one who found the pizza to be a bit unusual. I might have stared longer, but I didn't want the pizza to get cold. So I took a big bite. It definitely was not what I expected. I really liked it—as in I came back for another slice when I had a craving a week later. 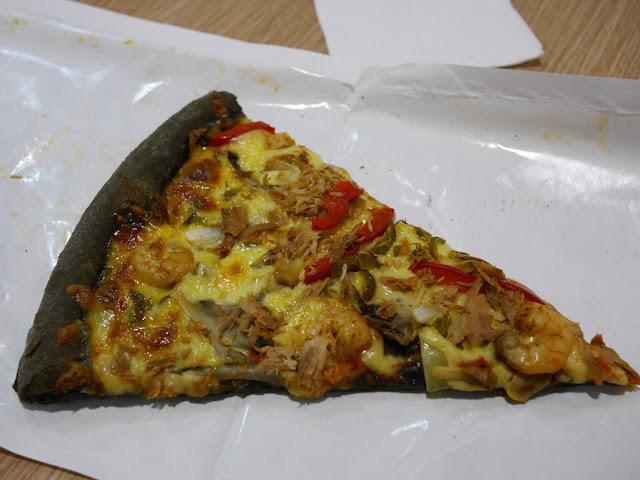 The crust had a very light flavor similar to the squid ink breads sold in some bread shops in China. It blended surprisingly well with the toppings, which included peppers, shrimp, and presumably either dried squid or cuttlefish. I suspect if people were blindfolded while tasting the pizza, many wouldn't notice anything unusual about the crust. Mr. Panda is not the only restaurant in the world serving a squid ink pizza. 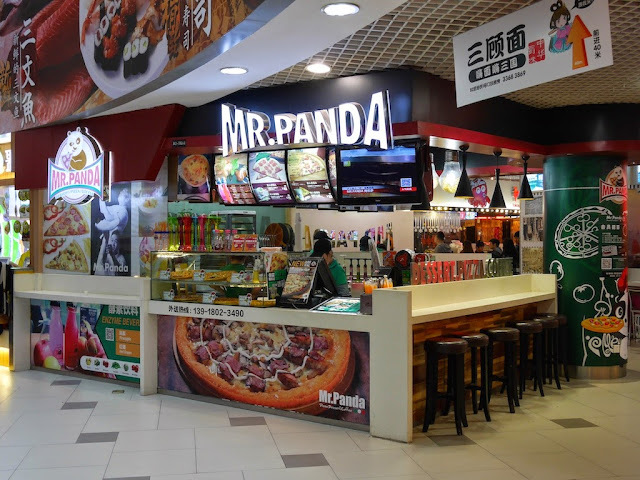 But Mr. Panda does serve as an interesting example of how both pizza restaurants and their customers in China are changing. More on that topic later. China has banned the national anthem from being performed at weddings, funerals, commercial and other non-political events, state media reports. Under new rules, the anthem is to be reserved for major political and diplomatic occasions, as well as places such as sporting arenas and schools. Performing the anthem in the wrong setting will lead to people being "criticised and corrected". I am not sure how the rules apply if a wedding is held at a sports arena. China's state TV accompanied coverage of the historic launch of the country's first space laboratory with a patriotic US song, America the Beautiful. . . .
Viewers of CCTV were treated to a minute-long animation set to the American song. I suspect some criticism and correction occurred at CCTV's offices afterwards. Regardless, China has not announced any bans on America the Beautiful—something wedding and funeral planners might want to keep in mind. As CCTV knows, it's a great piece. 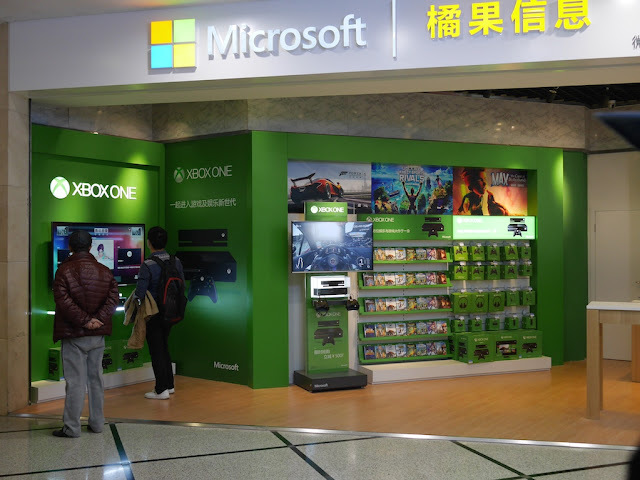 Recently at the Buynow (百脑汇) electronics shopping center in Shanghai's Metro City mall, I saw a Microsoft store set in two separate locations. 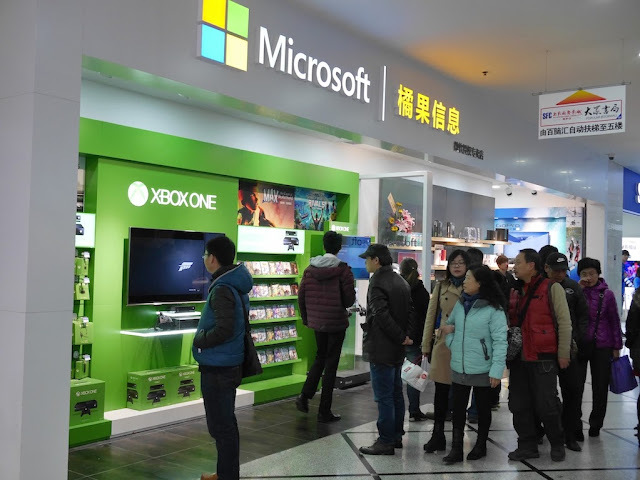 I didn't see any reason to assume it was a "fake", and Microsoft's store finder identifies this shopping center as holding one of the 18 stores it currently lists in China. 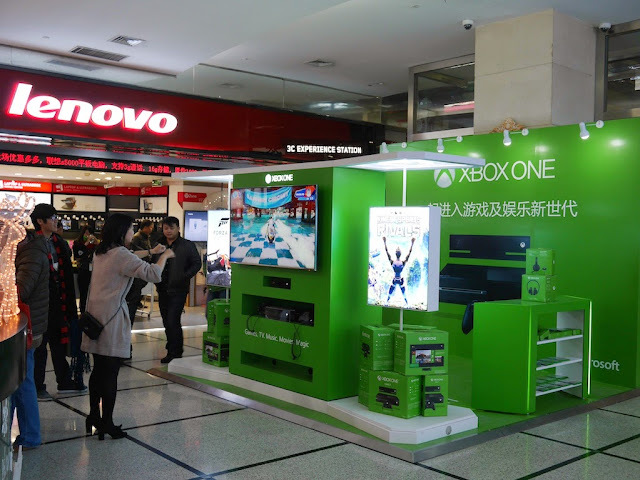 Much of the store space and a nearby promotion focused on the Xbox. There were tables with Surface tablets and Windows Phones as well. Notably, other than the Xbox games, I didn't see any software for sale. I will refrain from commenting further*. 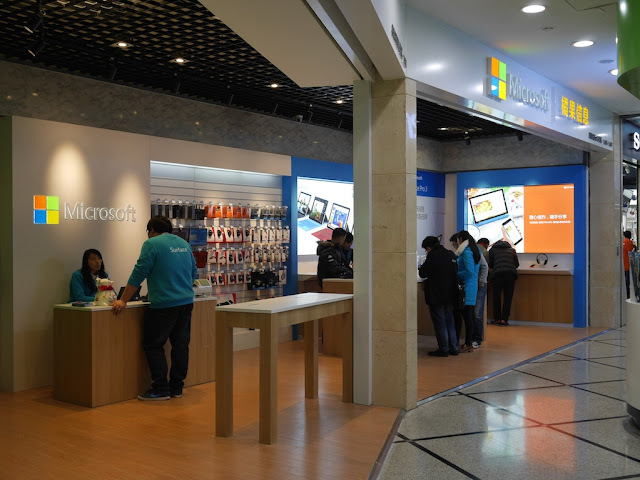 After sharing so much in the past about the many unauthorized Apple stores in China and the Android store in Zhuhai, I just figured I would take advantage of this opportunity to throw in a few Microsoft store scenes for some balance and a small taste of what Microsoft is now doing in China. *Disclosure: I previously worked as a user experience researcher for Microsoft China. 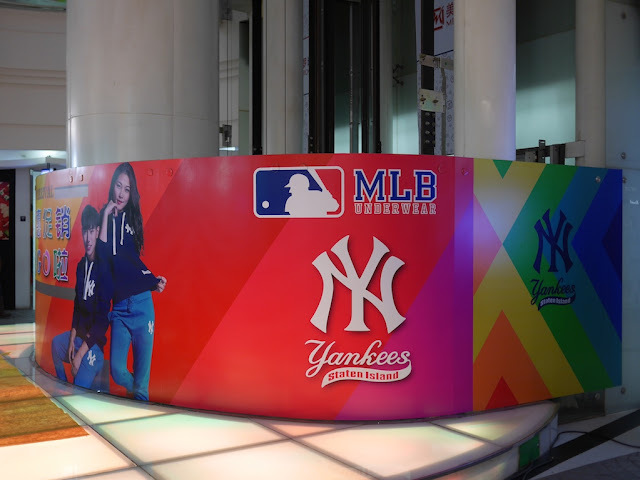 At the Metro City shopping mall in Shanghai I saw an advertisement for MLB (Major League Baseball) clothing. This didn't surprise me, especially since I had recently seen a MLB store in another Shanghai mall. The advertisement highlighted the Yankees. This also didn't surprise me. I have lately noticed more people in China wearing clothing with the New York Yankees "NY" logo. But one part of the advertisement did surprise me. Below the familiar New York Yankees logos were the words "Yankees — Staten Island". Staten Island is one of New York City's five boroughs, but the New York Yankees have a storied history in another borough, The Bronx. A baseball team might move from Brooklyn to Los Angeles, but a move from The Bronx to Staten Island was hard to imagine. Indeed, the New York Yankees remain in The Bronx. However, Staten Island is home to a minor league baseball team — the Staten Island Yankees. 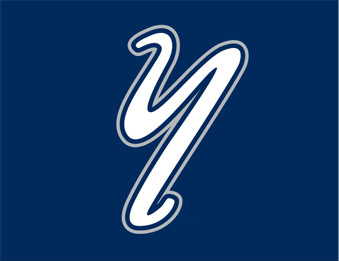 Nicknamed the "Baby Bombers", they are an affiliate of the New York Yankees. They don't use the "NY" logo and instead have their own cap logo. Given the New York Yankees enjoy far greater recognition and the clothes in the advertisement had the "NY" logo, it seems likely that the Staten Island Yankees reference was simply a case of confused identities and may fit into the category "a little bit of knowledge can be dangerous". Or not so dangerous . 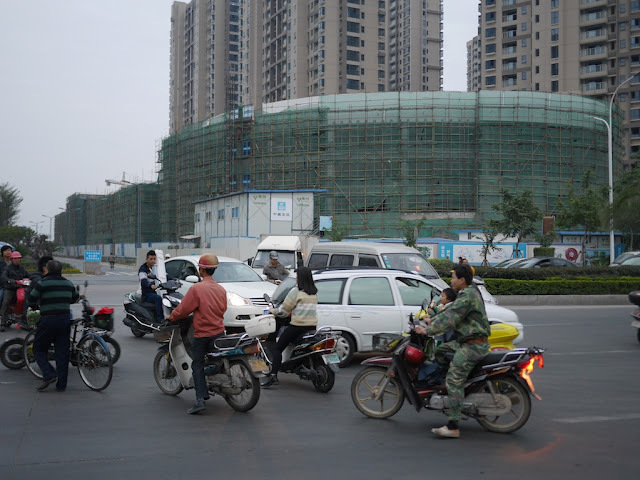 . .
Like other similar apparent mistakes I have seen in China, it may not have much effect locally. 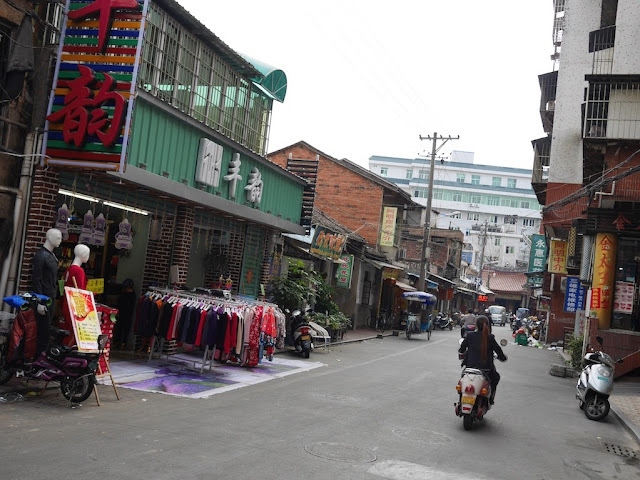 In other Chinese cities, such as Hengyang in Hunan province, I have spoken with people wearing clothes with the "NY" logo. Often, they said they didn't even know it represented an American baseball team, let alone a team in The Bronx. So the Staten Island reference in this case may not impact many people's perceptions or purchases. More interesting to me than a measure of American baseball knowledge in China, the mistake could be another hint that a seemingly seemingly obvious explanation, interest in the New York Yankees baseball team, does not best account for increasing numbers of people in China wearing Yankees-themed clothing. This touches on some bigger issues which I will return to in the future. But who knows, perhaps I got part of this wrong, and the Staten Island Yankees have a significant number of fans in Shanghai. Stranger things have happened. Just ask people in New York. In that case, the Baby Bombers sending Scooter the "Holy Cow" to China as a sports ambassador might be a "better-than-dandy" idea. 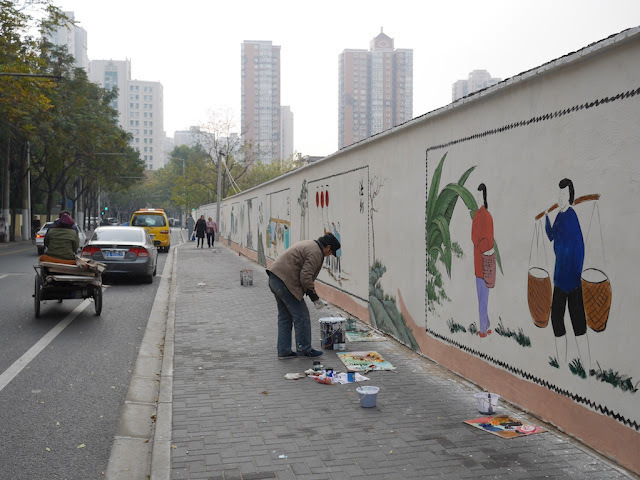 Yesterday I went from traditional-style scenes being painted on a wall surrounding a demolished neighborhood . . .
. . . to the Sausage Paradise at Jingan Kerry Centre's temporary winter wonderland. 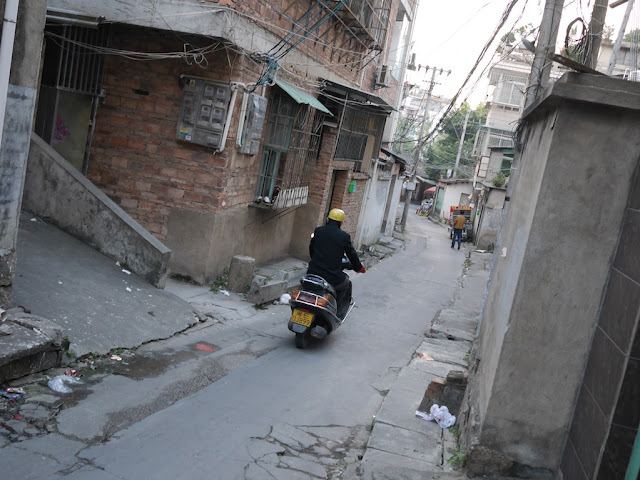 Despite their differences, both scenes capture some of the continued change in Shanghai. 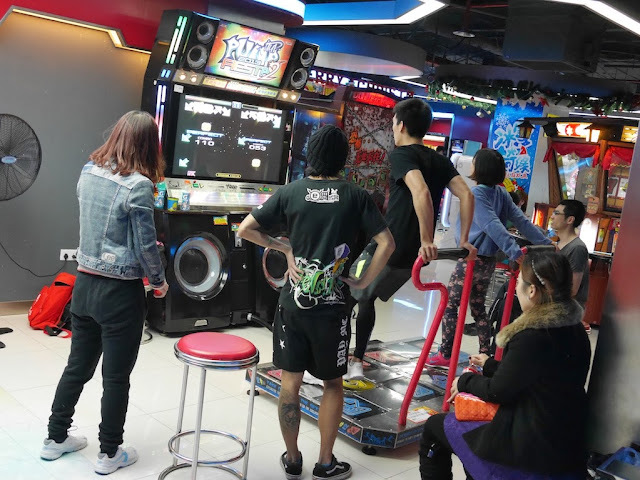 Dance games similar to Dance Dance Revolution are popular in many video arcades I have seen in China. 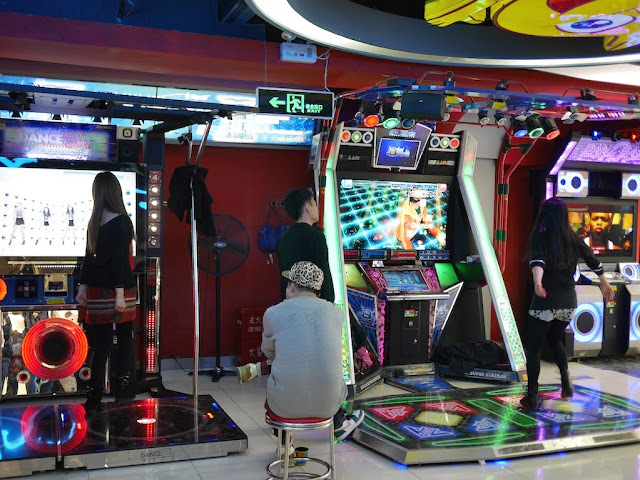 An arcade in the trendy underground D Mall in Shanghai has several. When I took a look today, most were in use, and some had people sitting in a row of chairs waiting to play. Dancing games aren't my thing, so I didn't jump in. 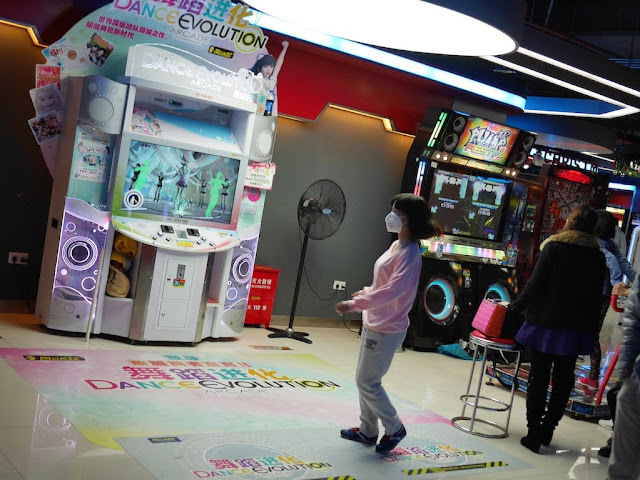 But recently a new online version of Dance Dance Revolution caught my interest. Ever wanted to be in the percussion section of an orchestra for the epic final bars of Tchaikovsky's 1812 Overture? Who wouldn't? All those firing cannons, thundering drums and crashing cymbals are just fantastic. Not to mention the full orchestra and rapturous audience in front of you. The viral news site Us vs Th3m has created a game that lets you control the greatest percussive cacophony in music history. I am not convinced the 1812 Overture is the greatest percussive cacophony in music history, but it makes a great choice for the game. Given my musical training, at first I found it odd I wasn't able to achieve a perfect score. The excerpt is not unusually difficult compared to other classical music, and the game allows a far greater degree of rhythmic freedom than most conductors would deem acceptable. After focusing on the music instead of the screen, I realized the visual cues, which aren't the way I am used to reading music, were sometimes causing me to hit the keys more quickly than the actual rhythms. So I tried playing more "by ear". My performance immediately improved, and I found 1812 glory. Perhaps there are some interesting perceptual/cognitive/motor issues to explore. 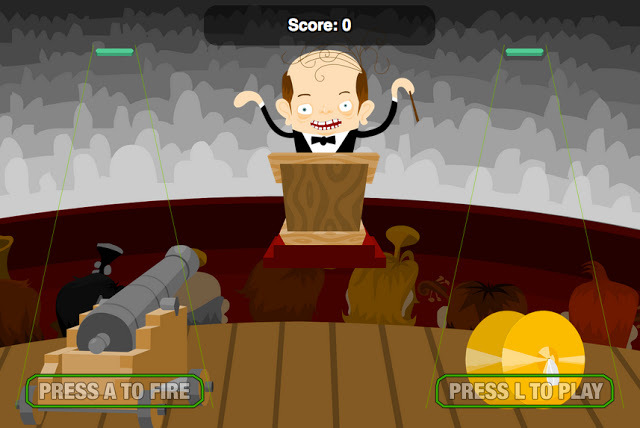 Whatever the case, you can play "Dance Dance Revolution: 1812 Overture Edition" here. Bonus points if you can explain how it is possible to score higher than the perfect score of 1812*. * I have scored 1844, and see others have as well, but not sure how. I suspect it involves the series of triplets in the cymbal crashes. I’ve been working for the government as a road sweeper for seven years and I work Monday to Friday, from seven in the morning till around four in the afternoon with a two hour lunch break. I earn 1,580rmb [about US $250 at the time] a month. It’s not too tiring. . . .
I’ve played with crickets since I was a child. I can tell from the sounds they make whether they are green crickets, yellow crickets or purple crickets, how big or small they are, how strong they are. You need to look after them well to make them strong. The back of a strong cricket’s head is oily and shiny, and looks like a ripe water melon. Famous emperors used to play this game. You need to change what you feed your crickets depending on their age. In the early days, you feed them rice with some medicinal herbs. When they are middle-aged, I make prawn porridge for them, with ant dust. The ant dust is from ants in Guangxi, the big ones. When they are almost ready to fight, I will give them pearl dust or ginseng dust. 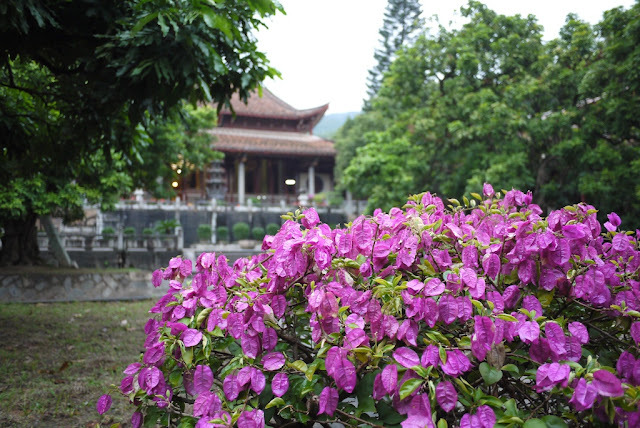 At the foundation of the People's Republic of China in 1949 the temple had a resident population of 60 monks, a figure which by 1965 had declined to 57. Used as a factory for a period during the turmoil of the Cultural Revolution (1966–1976), the monks were dispelled and all statues of deities smashed. 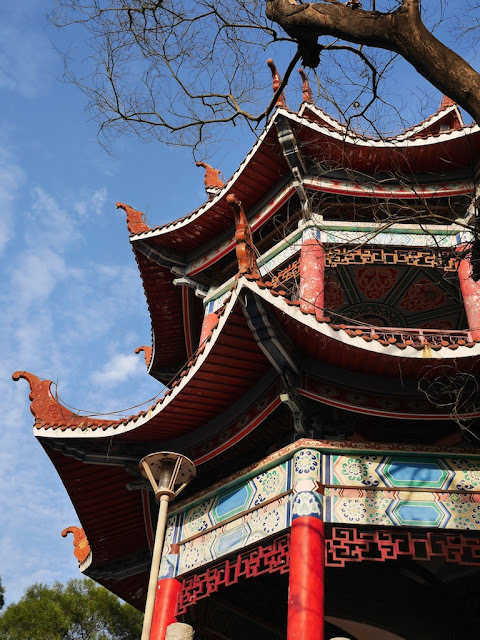 With opening up and reform during the late 1970s and the advent of religious freedom, Master Yuanchan (圆禅法师) from the Yechengguang Garden Temple (椰城广化寺) in Indonesia together with other overseas Chinese began to support the Guanghua Temple. 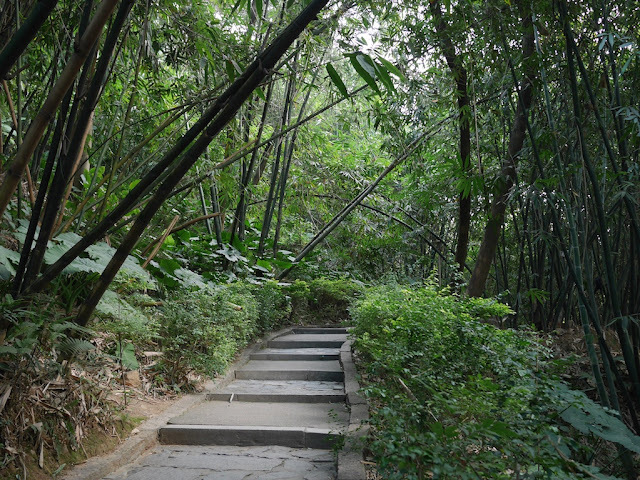 In 1979, a six-year restoration program began under the supervison of then 70-year-old Venerable Master Yuanzhou (圆拙老法师). 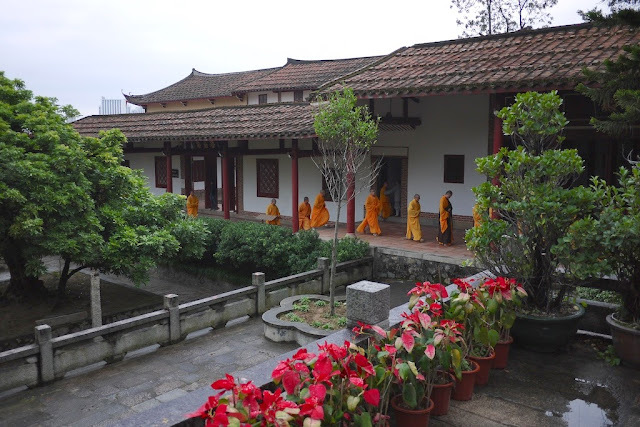 I don't have much time for a post today, so I'll share a scene from a place in Putian, Fujian province, where time seemed to pass differently — Guanghua Temple. 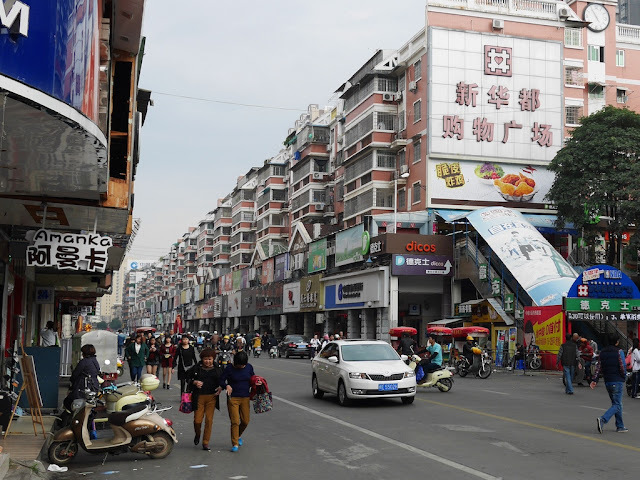 In a recent conversation, a person I met from Fujian province commented on the many high-quality fake shoes available in the city of Putian, not very far from her hometown. 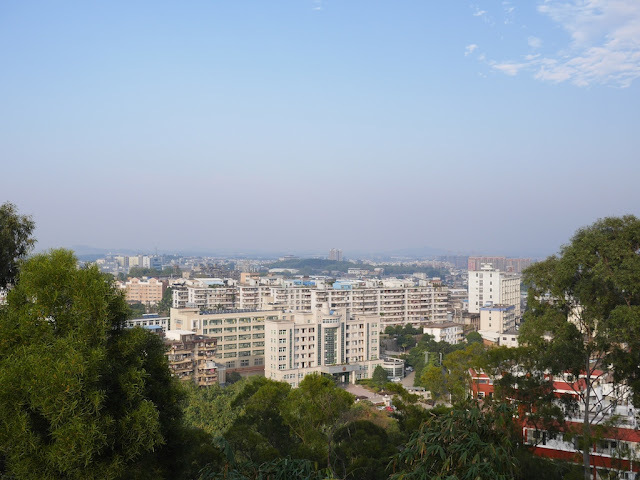 I don't have much to say about Putian's shoe industry, but it provides me an excuse to share more about the coastal city almost directly west from Taipei across the Taiwan strait. I never got around to several posts I had in mind when I was there two years ago. Fujian has great local cuisine, but the street food vendor was selling what the sign described as Korean sushi*, otherwise known as gimbap (or kimbap). My impression is that gimbap vendors are most popular with younger people. 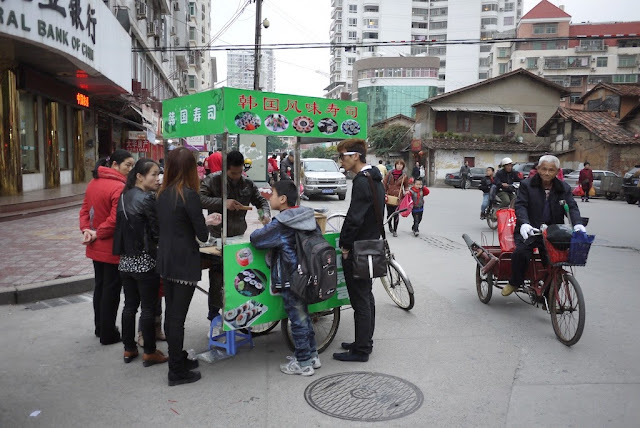 I have seen similar gimbap vendors in many other Chinese cities as well. Like New Orleans roasted chicken vendors, the gimbap vendors show how China's street food can extend beyond traditional Chinese offerings. *The sign's "韩国寿司" literally translates as "Korean sushi". My understanding is that "紫菜包饭" would be a more direct Chinese translation for "gimbap". 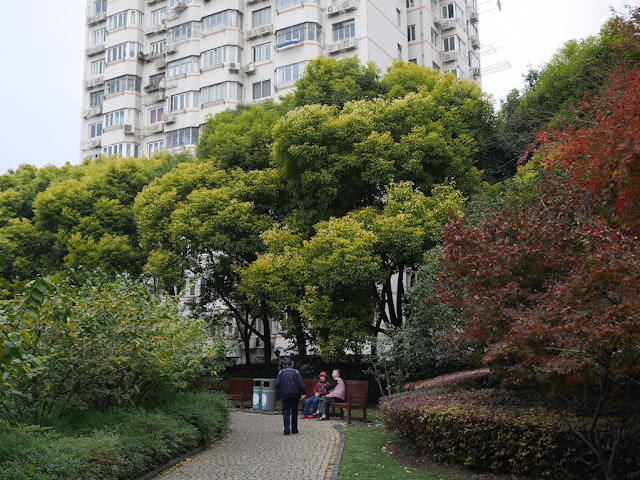 One day after I mentioned the fake indoor fall foliage at a mall in Shanghai, of course there were many leaves on the ground in Shanghai due to strong winds. The outdoor real leaves weren't as colorful though. 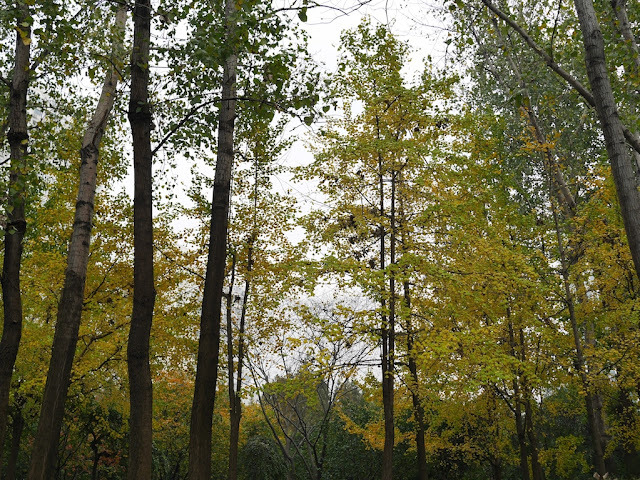 I would say most tree leaves in Shanghai are still greenish, but brown leaves on some trees are easy to find. And gingko tree leaves in particular have taken on a yellow hue. More leaves have fallen during the past week or so, which in turn leads to a desire in some to remove the leaves or encourage them to rest elsewhere. This past weekend I saw someone struck by this urge (or perhaps paid by someone else struck by this urge) using a piece of technology which made me think of James Fallows. His feelings regarding leafblowers are in part captured with a label he used to categorize a few posts about them: "Leafblower Menace". 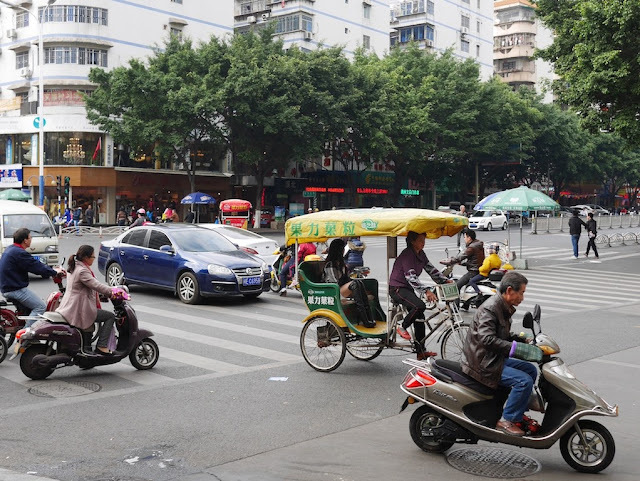 So I sent him a photo of a leafblower in action on Changping Road in Shanghai. I also sent him photos of people I saw later that afternoon on the same road using more traditional and quieter leaf clearing methods. 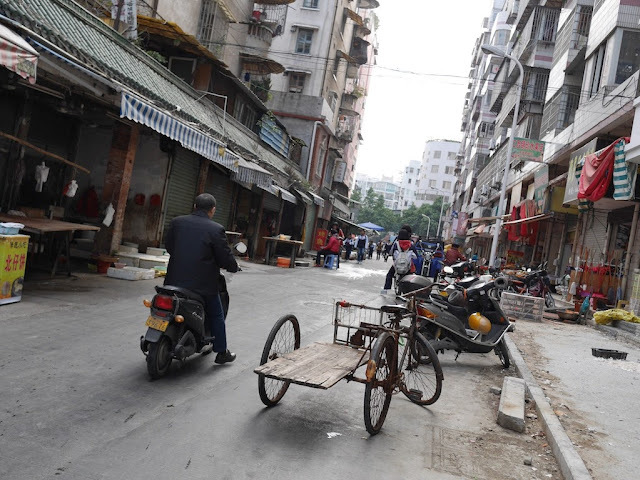 You can see the photos and few thoughts about them in his new post "China Catches Up". The people in the photos were primarily concerned about cleaning the sidewalk when I saw them. 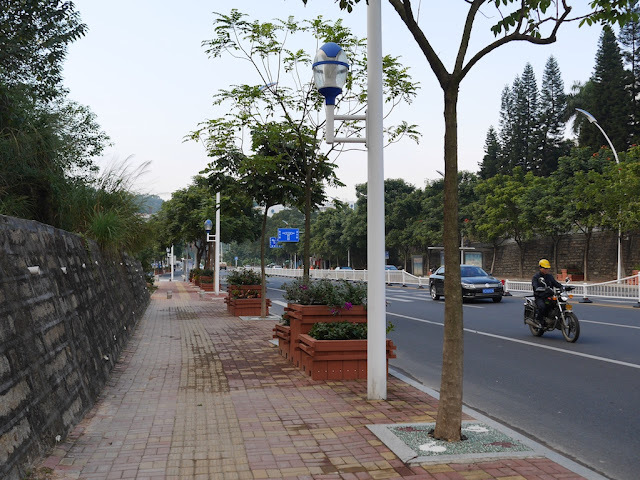 But, yet again on Changping Road, yesterday I saw technology specifically designed for cleaning the street. Fortunately for me, no water sprayed out. 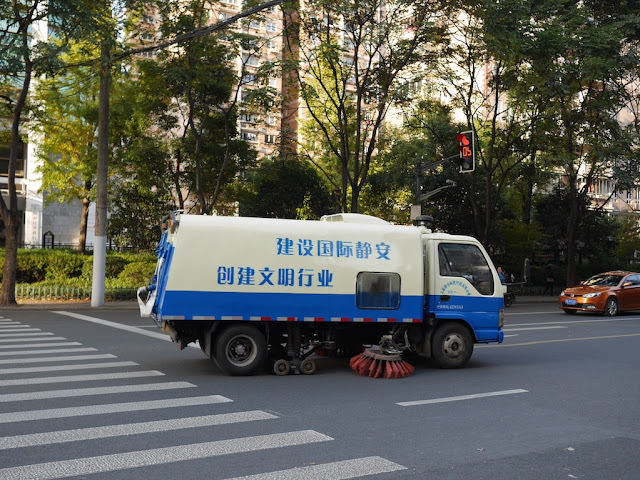 The slogan on the side of the street cleaning truck suggests to me that at least some people believe the truck represents progress for Shanghai's Jing'an district. 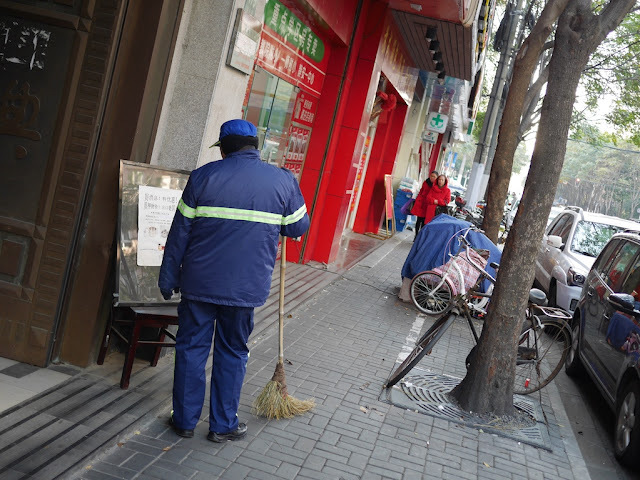 And I have seen far many more street cleaning trucks than leafblowers in China. Perhaps it is a positive sign I haven't seen any leafblowers with similar slogans. European Union Wants More "Effective and Complete" Censorship for the "Right to be Forgotten"
The judgment expressly states that the right only affects the results obtained from searches made on the basis of a person’s name and does not require deletion of the link from the indexes of the search engine altogether. That is, the original information will still be accessible using other search terms, or by direct access to the source. Google has since complied by censoring search results on a case by case basis only on its relevant European websites, such as Google.de for Germany. The "localization" of the censorship is similar to how Google once censored, and Bing continues to censor, search results for China — censorship specific to China's regulations only occurred/occurs on their China-based services. There would be an incredible outcry in places such as the U.S. and Europe had China insisted on their censorship rules applying elsewhere. The [data protection working group] considers that in order to give full effect to the data subject’s rights as defined in the Court’s ruling, de-listing decisions must be implemented in such a way that they guarantee the effective and complete protection of data subjects’ rights and that EU law cannot be circumvented. In that sense, limiting de-listing to EU domains on the grounds that users tend to access search engines via their national domains cannot be considered a sufficient means to satisfactorily guarantee the rights of data subjects according to the ruling. In practice, this means that in any case de-listing should also be effective on all relevant .com domains. Under EU law, everyone has a right to data protection. The key line here is not actually bolded in the original. It's the "this means that in any case de-listing should also be effective on all relevant .com domains." Basically, if it can be reached from Europe, it has to be blocked. Or, in even shorter form, "EU regulations apply around the globe online." Even if Google could address the E.U. 's concern by limiting E.U. users to local versions of Google or by censoring across all domains only for requests coming from the EU, either of these methods would likely be easily circumventable through use of a VPN, similar to how VPNs are used in China to access blocked websites. So, even though .com domains are specifically mentioned, it's hard to see how Masnik's summary for the guidelines, "E.U. regulations apply around the globe online", isn't accurate in the end since the search service providers are expected to guarantee "effective and complete protection". In general, the related issues I've been pondering fall into two categories: 1) the merits and practicality of the "right to be forgotten" and 2) the E.U. 's apparent attempt to unilaterally apply it globally. I will have more to say about both later and will end this post with a question related to China which feels somewhat surreal to even have to ask. Is it simply a matter of time until the E.U. demands a Chinese online search service accessible in Europe, such as Baidu, selectively "forget" something? In other words, could the E.U. cause even more censorship in China?